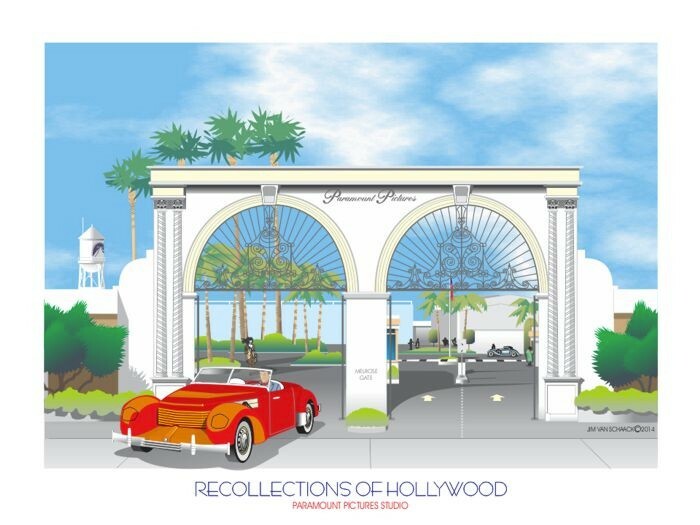 Age took its toll on Hollywood, so Jim Van Schaack created his “Recollections of Hollywood” digital art series featuring famous landmarks of Hollywood including Capitol Records, The Charlie Chaplin Studio, Cinerama Dome Theatre and more. Capitol Records is an unusual building, said to resemble a stack of records, was built in the mid1950s. 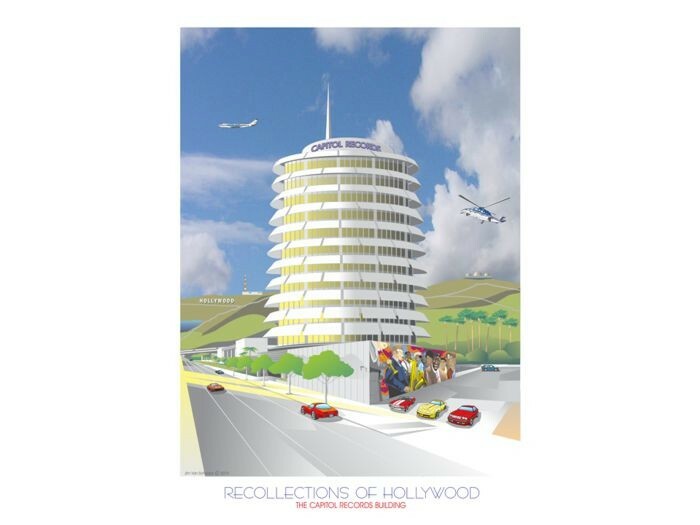 Capitol Records was the home studio of Nat King Cole, Peggy Lee, Frank Sinatra, Dean Martin, The Beach Boys, the Beatles, and Dave Koz to name a few of their top artists. The building is a favorite stop of many Hollywood tours as it is located near Hollywood and Vine. The Charlie Chaplin Studio is just west of the center of Hollywood, located in the first block south of Sunset Boulevard, is the Charlie Chaplin Studio. 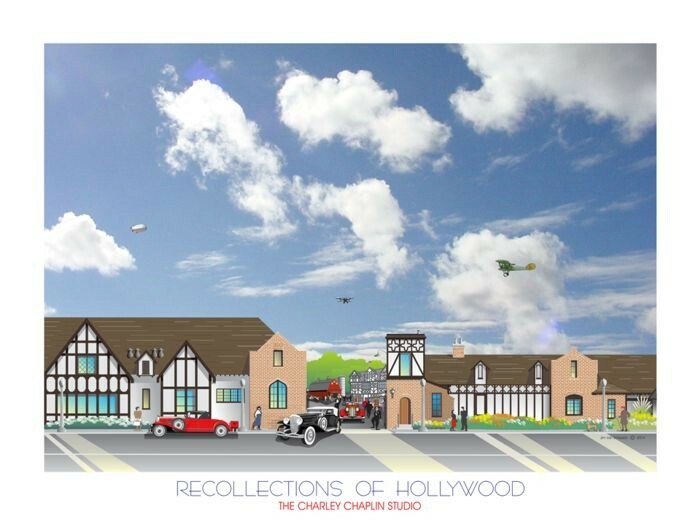 This studio was built with its Tudor style buildings in 1919 by silent screen star Charlie Chaplin. Although quite small by current standards, this studio is still in operation. The buildings that surround the production lot still appear much as they did long ago. The Charlie Chaplin Studio is currently operated by the Jim Henson Company. 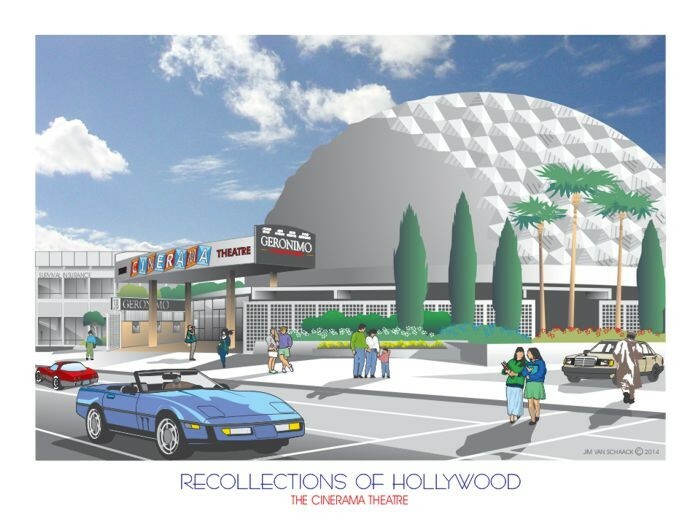 The Cinerama Dome Theatre is one of the newer structures in the Hollywood area. This distinctive domed building was the first wide-screen movie theater on the West Coast. 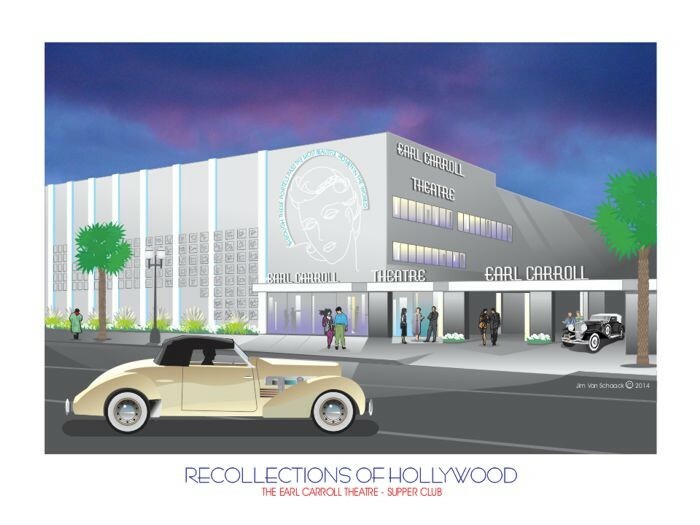 The Earl Carroll Theatre was open in 1938, on Sunset Boulevard by New York Impresario Earl Carroll. 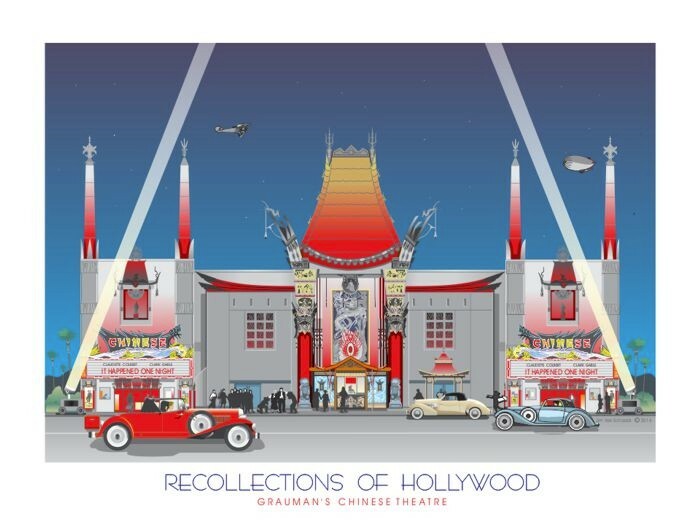 This dazzling night club and theatre who’s facade held two of Hollywood’s most renowned landmarks: the 20 foot high neon painting of Beryl Wallace, one of Carroll’s “most beautiful girls in the world” and the “Wall of Fame” presenting in cement the personal inscriptions to Earl Carroll of more than 150 of Hollywood’s most glamorous stars. The 60-foot wide double revolving turntable on the 80-foot main stage, the three swings which lowered from the auditorium ceiling, the elevator, revolving staircase and rain machine were part of a stage machinery complex not duplicated in any other theatre in America. Grauman’s Egyptian Theatre Yesterday & Today This famous theatre is located on Hollywood Boulevard in the heart of old Hollywood. 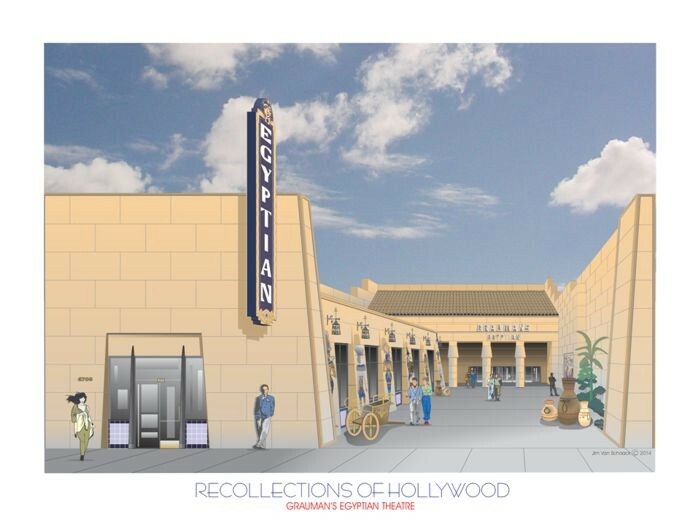 Built in 1922 by showman Sid Grauman with an Egyptian theme, it was the site of Hollywood’s first movie premiere. Recently renovated, this theatre is now operated by the American Cinematheque and shows movies on a regular schedule. Grauman’s Chinese Theatre, one of the most famous sites in Hollywood has changed completely since its opening in 1927, with the gala premiere of Cecil B. DeMille’s King of Kings. 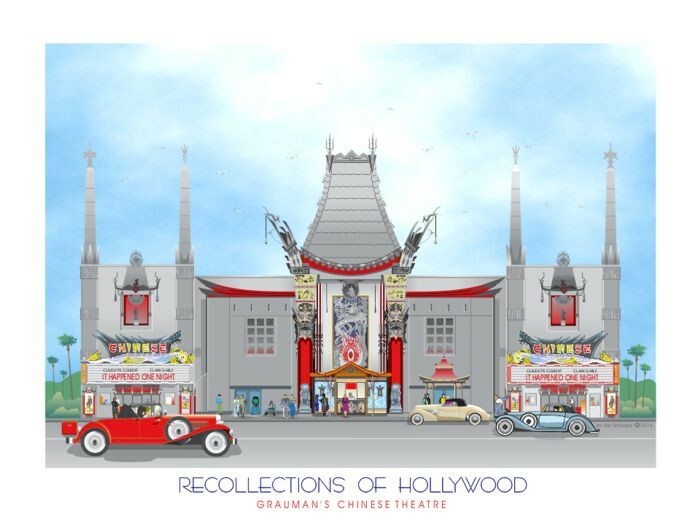 This spectacular Chinese themed theatre is possibly the most visited Hollywood landmark. It was the creation of Hollywood showman Sid Grauman. Much of the theatre’s attraction stems from the many glamorous premieres held here, with media, search lights, limousines, movie stars galore and screaming crowds. 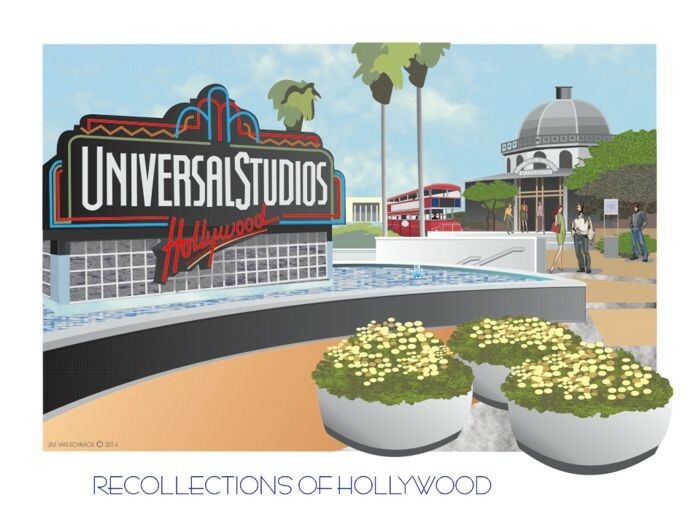 Another reason for the thousands of visitors is the theatre’s patio or forecourt with its signatures and hand and footprints imbedded in the concrete pavement of Hollywood’s most famous. The Hollywood Bowl is located only a few blocks north of Hollywood Boulevard. The site had been the home of a small band of Gabrielino Indians. In the 1920s the area had been a chicken ranch. 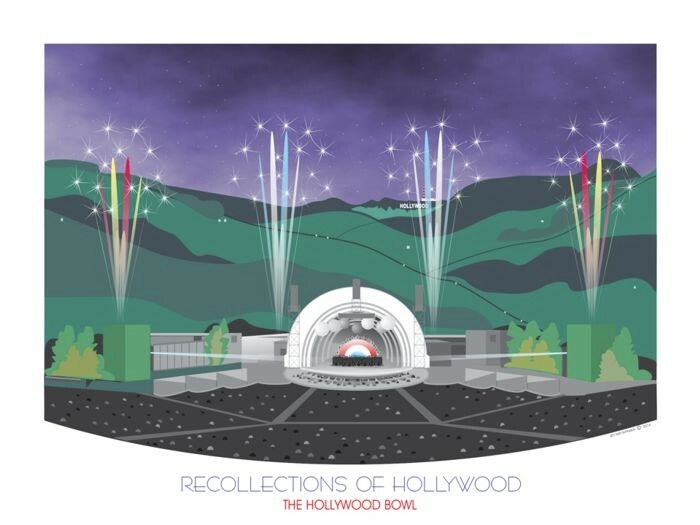 Because the site was a perfect amphitheater shape the Hollywood Bowl was built in 1926. On warm summer evenings up to 18,000 viewers gather to picnic, often in high style, under the stars to listen to classical, country, pop, jazz and rock music. The Bowl has been the summer home of the Los Angeles Philharmonic since the 1920s. Most popular concerts include the Easter Sunrise Service, the July 4th program, and the Tchaikovsky Spectacular with cannons, a military band and fireworks. 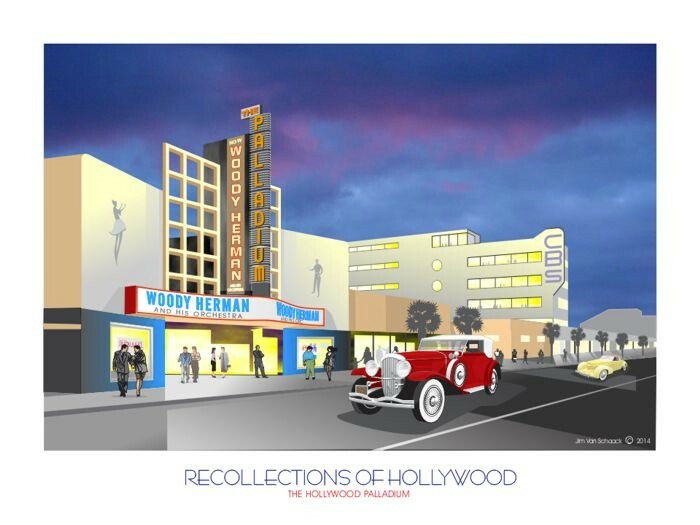 The Hollywood Palladium, Opened in 1940, the nightclub, ballroom has consistently presented top notch musical events. With it’s 11,000 square foot oval dance floor it can accommodate over 6000. In the early days The Palladium was Hollywood’s Flagship for fun where all of the name big bands entertained, Tommy Dorsey with Frank Sinatra, Glenn Miller, Woody Herman to name a few. On any evening, you might have seen familiar faces like Lana Turner, Rita Hayworth, Tyrone Power or Betty Grable. 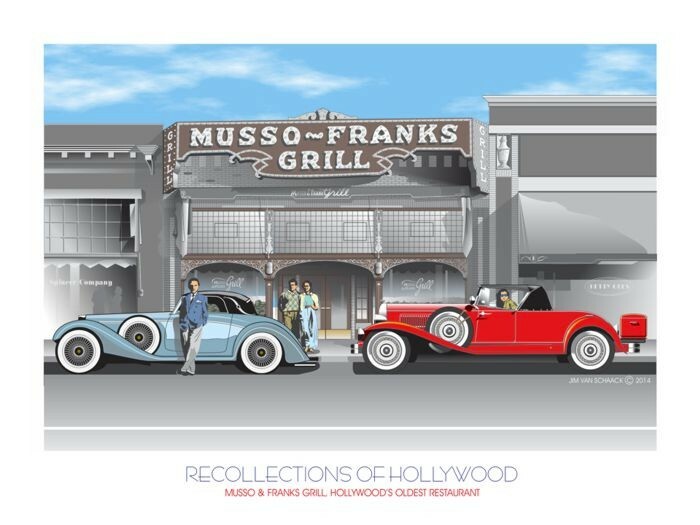 Musso and Franks Grill is Hollywood’s oldest restaurant, having opened in 1919. While the building has been modernized, the restaurant continues to attract Hollywood luminaries and visitors from around the world. Paramount Pictures Studio is the gateway to one of Hollywood’s most famous studios. Blockbuster films produced at Paramount Studios include: The Ten Commandments, The Godfather, Forest Gump, Top Gun, and Raiders of the Lost Ark. The founder of Paramount Pictures was Adolph Zukor. Celebrities included actors Rudolph Valentino, Marlene Dietrich, the Marx Brothers, Carole Lombard, Bing Crosby, Bob Hope, Sophia Loren, Audrey Hepburn, Tom Hanks, Eddie Murphy and Tom Cruise have all worked here. Universal Studios, founded in 1912 by film pioneer Carl Lemmle. In 1915 the company launched Universal City a 230 – acre municipality. Universal is an attraction for visitors from around the world where they visit an operating studie and see how pictures are made behind the scenes. Director/Producer Steven Spielberg has brought Universal numerous successes, including Back to the future, Jurassic Park and ET.